Lizzie Finnegan reviews Viet Thanh Nguyen’s Nothing Ever Fies: Vietnam and the Memory of War for The Public. 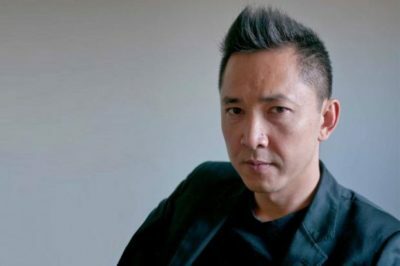 “I was born in Vietnam but made in America,” begins Viet Thanh Nguyen’s kaleidoscopic exploration of memory and loss, Nothing Ever Dies: Vietnam and the Memory of War. The theme of a divided self, of a deep sense of homelessness, pervades Nguyen’s work. Born in Ban Me Thuot in South Vietnam in 1971 to parents who were immigrants from North Vietnam, Nguyen spent only the first four years of his childhood in the country of his birth. After the fall of Saigon in 1975, his family fled as refugees to the United States. Today he is the Aerol Arnold Chair of English and Professor of English and American Studies and Ethnicity at the University of Southern California. His first novel, The Sympathizer, won the 2016 Pulitzer Prize for Fiction; in 2017 he was awarded a MacArthur Genius Grant. His new book of short stories, The Refugees, was published in 2017. He will speak at Kleinhans Music Hall at 8pm this Friday, March 23 as part of the BABEL series curated by the Just Buffalo Literary Center. Nguyen’s prose is dizzyingly poetic in both his fiction and nonfiction. He has an unsettling way of unearthing the emotional and cultural minefields we unthinkingly reconnoiter every day: the ways in which we carelessly ignore the concerns of those we have identified as “other”; the way we enfold American nationalism into every corner of our lives without question; the ways in which we support eternal war with the casual cruelty of children—with every purchase, every turn of our car’s ignition key, every phone call or click on the internet, every airplane trip, every house-cleaning session, every bank transaction—each of these a gesture of support for the corporations that also make the tanks and ammunition, that harvest the oil and other resources from the countries we invade and occupy, that enslave the populations we so readily dismiss. In a sense, this book itself reverberates with its own double consciousness, or, perhaps, multiple consciousnesses. Destabilizing the boundaries between memoir and history, between art and politics, between citizen and bureaucracy, between self and other, Nothing Ever Dies indicts a history of American foreign policy inseparable from self-serving nationalist ideologies and—even more unsettling—from an almost pathological streak of inhumanity that most Americans resolutely refuse to see. With a stunning unity of form and content, Nguyen has given us a collage of diverse and sometimes contesting voices that demonstrate the impossibility of either remembering or forgetting with impunity or without complicity. I am teaching Nothing Ever Dies this semester in a First-Year Liberal Arts Seminar at D’Youville College, a course for which faculty choose a theme around which to structure readings and assignments. My theme this semester is “Mysteries of Memory & Feats of Forgetting”; over these 16 weeks, we explore the shadowy drama of human consciousness: repressed and recovered memories, collective memory, cultural memory, trauma, amnesia, and neurological disorders of memory. We’re reading fiction, medical case studies, war stories, science fiction, poetry, film, historiography, and memoir; in our discussions, we work with conflicting perspectives on the reliability and fallibility of memory; look at examples of the relationship between memory and art; debate the responsibility to bear witness; and struggle to comprehend the interdependence of memory and identity. For the course, students first produce a personal memoir project, and then spend the majority of the semester creating an online multimedia collage installation on a topic, person, or event that resonates in American collective memory. We’re reading Nguyen’s book as part of our investigation of the politics of public memory and what (or whose) histories are chosen to be remembered—or erased—in memorials, textbooks, art, movies, and the media. My 40 or so students and I will be attending Nguyen’s upcoming talk in the BABEL series, and a major part of our class activities with the book has been to prepare them for that event, including writing questions to submit to the author for the Q&A session. What do words like this, arguments like this, mean to an 18-year-old college student? While responses were varied, many of my students, in their written reflections and verbal comments, have taken these ideas deeply to heart, some writing about their own “double consciousness” experience of being resolutely American and yet now also seeing themselves, for the first time, through the eyes of others. The view from there is not as rosy as the view we have of ourselves from inside our social media pages, safely ensconced in our sleek and well-appointed homes complete with every imaginable device and appliance, consuming the rest of the world with an insatiable appetite for our own entitlement. The view from outside chastens, even shames us; so many of my students came to class asking: what can we do? How can we change—change ourselves, change our country, change our world? How do we go about ending endless war? We found the most inspiring answers to these questions in Nguyen’s insistence on art as a method of waging peace and his call for artists to stand up and speak out against the inhumanity of war and of nationalism, to embody and model the humanity we must strive for if we wish to be an ethical society. We talked about their own projects for this class as projects of what Nguyen calls “just memory”—a memory that demands that we acknowledge the humanity of those we call others while at the same time forcing ourselves to look unwaveringly at our own inhumanity toward those others. The project proposals I am seeing from these first-year students are ambitious in both scope and purpose. These young Americans are committed to creating, through research, writing, and creativity, works of art that do justice to “the forgotten, the excluded, the oppressed, the dead, the ghosts”—to righting the wrongs of our collective “unjust memory” by demanding of themselves that they allow the Other to compel them to justice. That Nguyen himself is one such artist is clear. My hope is that, in encountering the visionary humanity of his work, my students will locate their own humanity; that they will summon the courage to engage our brutal war machine with their own heads and hearts, letting the diver’s bell down deep into the rage and compassion and creative power that slumbers inchoate within them, ready at any moment to awake.